According to The Association of American Feed Control officials (AAFCO, 2000), premix is termed as ‘a uniform mixture of one or more micro-ingredients with diluent and/or carrier.’ These ingredients are usually required in small amounts (micrograms or parts per million) and are not intended for direct feeding to animals. This report estimates the size of the global market in terms of value. 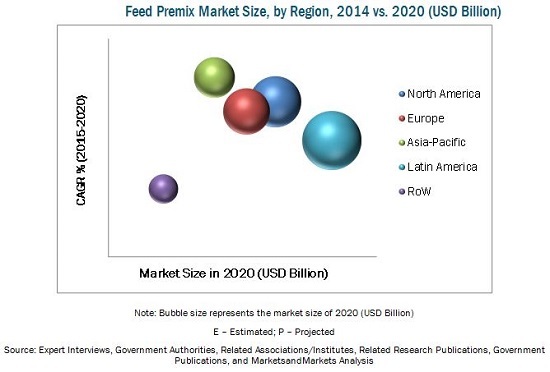 The market for feed premix is projected to grow at a CAGR of 3.0% to reach USD 10.26 Billion in 2020. The market was dominated by the Asia-Pacific region in 2014 where China, India, and Indonesia were the important consumers in 2014. Drivers, restraints, opportunities, and challenges of the market are also discussed in detail in the report. In the next five years, vitamins are projected to gain better prospects as the fastest growing segment in various geographic regions. The application of feed premix is projected to witness strong demand from poultry and ruminant breeding industries. This report provides the complete analysis of key global players in the feed premix market, with a clear insight on developments, trends, and their product portfolio. This report includes the profile of the leading players of this industry such as Koninklijke DSM N.V. (The Netherlands), Cargill, Incorporated (U.S.), Nutreco N.V. (The Netherlands), InVivo Nutrition Et Sante Animales (France), and Archer Daniels Midland Company (U.S.). With a huge opportunity in the market, the business segments and product portfolio of these companies have been undergoing a significant shift to be organized into a structurally and strategically strong market force. Our current competitive scenario of feed premix market provides valuable inputs that can validate the strategic decisions to be employed in the future by feed premix manufacturers. Companies engaged in the development and marketing of feed premix portfolio comprising vitamins, minerals, and amino acids can avail a concrete view about the market structure in key countries. The report projects the analytical and qualitative requirements for important stakeholders involved in this market such as compound feed manufacturers & traders, feed formulators, specialty ingredient manufacturers, and pet food industries. This report focuses on the global market. This research categorizes feed premix on the basis of ingredient type, livestock type, and region. The feed premix market is projected to reach USD 10.26 Billion by 2020, at a CAGR of 3.0%, as studied from 2015 to 2020. The market for feed premix products has a significant impact on the animal nutrition industry. Feed premix is broadly categorized based on their type into vitamins, minerals, amino acids, antibiotics, and others include enzymes, preservatives, organic acids, antioxidants, pigments, and flavors. The feed premix market is also segmented on the basis of livestock into poultry, ruminants, swine, aquatic animals, and other animals which includes pet animals, birds, and reptiles. Growing awareness regarding the importance of health and hygiene of livestock has been a significant driving force for this market after immense livestock loss caused by avian flu outbreaks in Asia-Pacific regions. Feed premix products provide a wholesome nutrition, metabolic efficiency, effective growth and development, and health protection to livestock. In order to ensure healthy growth of poultry, swine, and cattle, vitamins and minerals must be supplemented while preparing the feed for consumption. 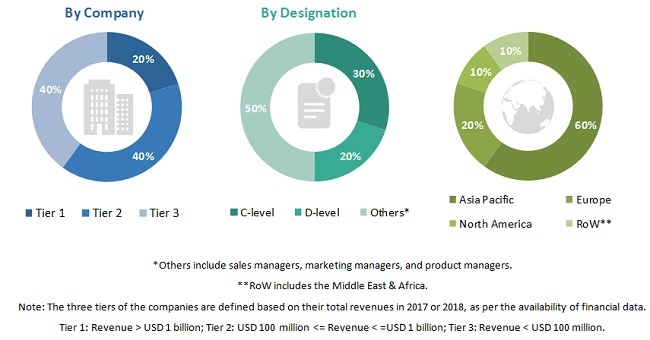 The market for feed premix in North America is projected to reach nearly USD 2.5 Billion in 2020 and is expected to remain as a strong market along with Asia-Pacific region. The Asia-Pacific region accounted for the largest market share in 2015 and is projected to grow be the fastest-growing market during the review period. The feed premix market of key developing regions such as Asia-Pacific and Latin America witnessed the entry of important market players, business units, and research centers of key players. The key players in this market have been involved in the process of developing a range of customized solutions to target specific needs of the livestock breeders and cattle owners. Thus, the feed premix market has been gaining more global presence and acceptance among customers. Leading participants in this market include Koninklijke DSM N.V. (The Netherlands), Cargill, Incorporated (U.S.), Nutreco N.V. (The Netherlands), InVivo Nutrition Et Sante Animales (France), DLG Group (Denmark), Archer Daniels Midland Company (U.S.), and AB Agri Ltd. (U.K.). These players have been implementing different strategies to achieve growth and development in this market. Especially, investments on development of innovative products and capacity expansions exhibit the strong competition to capitalize on the market demand for feed premix products.